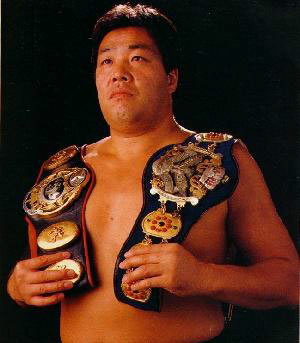 Jumbo Tsuruta will be remembered as a legend of Puroresu forever, like Rikidozan, Giant Baba, and Antonio Inoki by the wrestling fans. He had 3,329 matches in Japan over 26 years. He won the AWA World heavyweight title, United National heavyweight title (five times), International heavyweight title (three times), Triple Crown title (three times), International tag team title (eight times), PWF World tag team title (two times), and World Tag Team title (six times). To see the definitive retrospective of Jumbo Tsuruta's career, including a record of all the major matches he had throughout his career, click here. Masanori Horie is considered one of the leading reporters and historians of Japanese wrestling. He lives in Tokyo and is featured for Rob's Wrestling World.